Wooden board – 2 cm thick, specially selected solid pine wood (or, in case of the natural background version, oak wood). It has various shades, dark knots and bright lines running along and across the surface. Each product is made to order and therefore, depending on the batch of wood, it also has its own unique features, colour and wood grain. 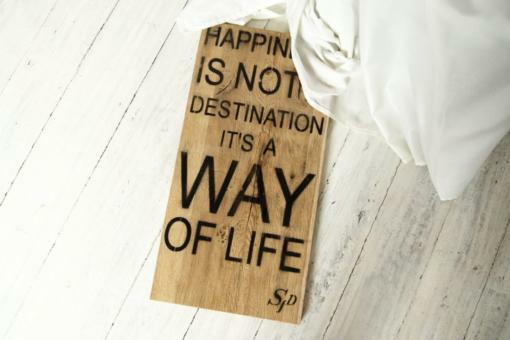 Wooden hanging sign with timeless text: “Happiness is not a destination it’s a way of life”. Simple and beautiful inspirational sign. For those who value happiness and enjoy every moment of life. It can be hung on the wall or leaned against it. Good for home, office, restaurant etc. Home decor that create a positive atmosphere in the room. It is a modern and popular alternative to a traditional framed painting or a motivational poster. There are three colour versions of the wooden decor sign: with a white, black or natural (the original colour of the wood) background.